"Father! Father Ygnacio! There's a crazy man in the church! He's going through your vestments! Come quick!" Carlito, the most talented pupil among my Eudebe and Opata converts and the best Spanish speaker, garbled his speech with native words. The situation must be serious. I lifted the skirts of my black Jesuit robe and dashed up the hill toward the mission church, leaping half-picked rows of frijol beans, detouring around the straggling squash vines, leaving the field where I'd been helping my converts with the harvest. I tore through the church door and skidded to a stop, panting. Holding my breath between gasps, I listened. Sure enough, noises of rummaging came from the sacristy and a voice speaking. I rushed to the back of the church and flung open the door. Two paces away, amid fallen chasubles and stoles, stood a wild-eyed young man, bareheaded, his dark hair standing up in peaks. Medium height, thin to emaciation and hatchet-faced, he wore a ragged Jesuit robe, gray with dirt and dust, and was holding my best alb against his body as if trying it for size. He'd been at our last annual meeting, hadn't he? "What do you think you're doing? I don't recall your name and don't appreciate your pawing through my vestments." He drew himself up and turned with regal deliberation, as though I'd intruded on an audience with the pope. He sniffed, looking me up and down. "You don't look like a sybarite: tall, thin, hardened by manual labor, hawk-nosed, blond. German or Swiss, I'll bet. But you are a sybarite, Father. Just look at all this worldly finery! And don't try to tell me all this lace, these gold-trimmed satin stoles and chasubles are for the glory of God. This is worldly ostentation! You need to use your resources for your flock, not to glorify yourself!" His rebuke tumbled out with utmost scorn and in excellent High German as if he could tell at a glance I would understand. In itself, that struck me as peculiar. We German Jesuits had learned, as soon as we arrived in Spain, that it was considered next to heretical to speak our native tongue. Whenever a Spanish brother caught us speaking it together, he would reprimand us. "¡Habla cristiano! Speak Christian," which meant, of course, Spanish. I answered my madman in German, nonetheless. "My name is Ignaz. Ignaz Pfefferkorn. My official name in the Company is Ygnacio. And yours?" "Wolfgang Wegner. The Company calls me something else, but I've forgotten it. Rejected it. Wolfgang was what I was christened, and Wolfgang I am." "And your mission, Pater Wegner?" I used his German title. "I was sent to assist Bartolomé Saenz at Cuquiárachi Mission, among the Upper Pimas. He and I don't see eye to eye. He tells me he's a Basque from Salvatierra in Áraba Province. Studied in Pamplona--that's Navarre." He nodded, as if that opaque statement clarified his situation. "I walked out. I've been wandering a bit. Suppose I'll go back one of these days, if he'll have me. He may have denounced me already to the Provincial." His eyes found mine again. "And you? Where are you from? How long have you been here?" Wolfgang must have taken too much sun and was off his head. I needed to get him out of my sacristy. "Why don't you sit with me over a cup of tea? I'll answer all your questions and we can discuss worldly goods, missions and such. Does that tempt you?" He dropped the alb and stepped toward me. "The offer of something wet, something to drink, tempts me mightily, but tea? What necessary item for your flock have you sacrificed to buy such a luxury?" "Not bought, gathered. I tried drying and steeping mesquite leaves. They're not a bad tea substitute. Once I found that out, I gathered them young and tender and now have quite a store laid by. My flock didn't suffer on account of my 'tea'." He cocked his head on one side, fixing me with his intense stare. "How did you know it wasn't poison?" "My Indians taught me. If they're not the bitter kind, mesquite beans are edible at any stage. It stood to reason the leaves would be, too." He followed me out of the church. I waved reassurance at Carlito, whose mop of straight hair and one wary eye appeared around the corner, then led Wolfgang to my house and into the kitchen. The house was cool, with its walls of sun-dried and plastered adobe brick. I laid shredded bark and sticks of wood on the coals I kept live, blew it all into flame and hung my sooty water pot on the hook above the fire. "The water will heat in a few minutes. Meanwhile, sit and we'll talk." "I'll sit when you've answered my questions. In case you forget, I wanted to know where you're from and how long you've been here." "Ah! That's easy. I'm from Mannheim-am-Neckar. I landed in Veracruz in 1755 but didn't get started in mission work until the following year. I've been here ten years now." "Ha! I thought I heard a Rheinlander twang in your speech." He pulled out and settled on one of my chairs of peeled saplings and strips of rawhide, elbows on the primitive plank table. I set out two clay mugs and the teapot, fished a spoon from the covered basket on the trestle counter, and opened the old metal canister that held my mesquite tea leaves. I measured four spoonfuls into the pot and filled it with boiling water. My eccentric guest gave me a wild-eyed glance. "Luther was right, of course." I poured the tea. "What on earth are you getting at?" He ran his hands through his wild hair, ruffling it further. "Faith, not works. You think we get to heaven on our own, by observing our rituals, working hard, doing good and such like. Pharisees! Luther knew that without the firmest faith--and most of all without God's grace--you get nowhere, no matter how hard you work. You and your ilk with your silks and prescribed liturgy, your teas and your fine decorations, you'll go to Hell anyway without the grace of God. Sola fide, Luther said. By faith alone. Alone!" I looked at him in pity. Here was a man in deep crisis, a crisis that had driven him mad. I spoke gently. "My son, you're undergoing a severe trial of your own faith right now. Isn't it so?" It seemed minutes before he raised his eyes, full of fury. "Who asked you to delve into the struggles of my soul? You hypocrite! You whited sepulcher!" He leaped up, spilling his tea, and reached the door in two strides. "I'll try to make it at least part-way to Opodepe. Thank you for your hospitality." His last word dripped with sarcasm. 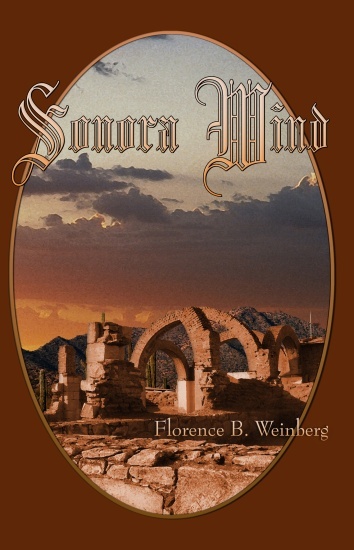 Sonora Wind Copyright © 2009. Florence Byham Weinberg. All rights reserved by the author. Please do not copy without permission. This page last updated 11-02-09.